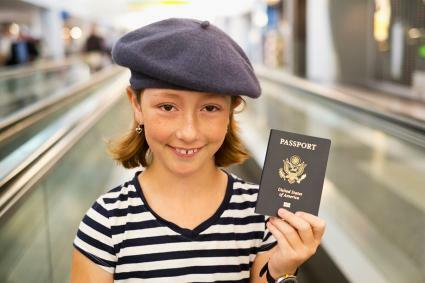 If your child will be traveling outside of the country, he or she will need a passport. This is true for kids of all ages, even infants. Passport applications must be made in person at a passport acceptance facility. You should complete the application form and ensure you have the appropriate documents before going to a facility. When preparing to apply for a passport for your kids, the first thing you should do is fill out Form DS-11. This form is required for all minors applying for passports, as well as for adults who are applying for the first time. You should fill it out before submitting the application in person, but you should not sign it until an authorized agent asks you to do so. Does a Newborn Need a Passport When Traveling to Mexico? Important note: a notarized copy is not sufficient; this is not the same as a certified copy. You will also need to submit a second copy of the document, which can be an additional certified copy or a photocopy. Children cannot apply for a passport without the knowledge of their custodial parents. The requirements for parents vary based on whether the child is under or over 16 years of age. Once a teen reaches the age of 18, no parental involvement is required for passport issuance. When applying for a passport for a child under 16, you must provide documentation that gives the names of the parents or legal guardians of the child, such as a birth certificate, adoption decree, divorce decree, or custody decree. Both parents must specifically consent for a passport to be issued for the child. If at all possible, both parents should accompany the child to apply for the passport. If that is not possible, acceptable documentation will have to be provided. Requirements vary based on the situation. Sole parental responsibility: The parent must submit proof that he or she has sole responsibility for the child. Examples of acceptable documents include a birth or adoption certificate that lists only you as the child's only parent, a death certificate for the second parent, or a divorce degree or court order specifying that you have sole legal custody of the child. One parent unable to appear: A parent who is not able to appear can fill out a Statement of Consent (Form DS-3053) and have it notarized. The original notarized document and a photocopy of that parent's valid ID must be submitted along with the application. Neither parent is able to appear: In situations where it is not possible for the child's parents to appear, both parents can provide a third party with a notarized Statement of Consent. In situations where the location of both parents is unknown, there is a Statement of Exigent/Special Family Circumstances (Form DS-5525) that can be submitted. Teenagers old enough to have their own identification, such as a driver's license or state-issued ID card, can apply for a passport on their own as long as they can demonstrate that at least one of their parents knows they are doing so. This can be done in one of two ways. In-person: One parent can accompany the teen when he or she applies for a passport in person. Signed statement: The teen can bring a notarized, signed statement from one of his or her parents or guardians indicating consent for the teen to be issued a passport. The teen must also provide a photocopy of that parent's identification. The photocopy must include the front and back of the document and cannot be enlarged. It must be printed on 8 1/2" X 11" paper. When applying for a passport, the parent(s) and/or child will have to present proper identification. You will need to show the original document and submit an exact photocopy with the application. The copy must be printed on 8 1/2" X 11" paper. The document can't be enlarged and the copy must include the front and back. You must provide a 2" x 2" current photo of the child along with the application. While some passport acceptance facilities provide fee-based photo services, this is not true of all of them. If you are hoping to have a photo taken when you turn in your application, verify whether or not this service is available at the facility you plan to visit. The picture must follow specific passport photo requirements, including that no one else can be in the photo with the child and children must be photographed in front of a plain white background. It is preferred that children look directly at the camera for their passport photos. You will need to pay a $35 execution/acceptance fee plus the cost of the child's passport at the time you submit the application. Fees vary based on the age of the child and requested passport style. The fee for 16 and 17 year olds is the same as for adults. Go to a passport acceptance facility with your child to submit his or her passport application. (Note: Parents don't have to accompany 16 and 17 year olds.) Take all of your documents and your child's documents with you, and be prepared to sign your application while you are there, in the presence of an authorized representative. Note: Some facilities require appointments. Check all requirements for your chosen passport acceptance facility ahead of time so you don't find yourself in the unfortunate situation of having to make more than one trip. Passport approval generally takes four to six weeks, though delays are possible. Upon approval, initial, non-emergency passports for kids under 16 are valid for five years. Those issued for kids 16 and over are valid for the same 15-year timeframe as for adults.